Are you a couple who want a small and intimate ceremony for just yourselves, two witnesses and a few family or friends? Then the Register Office may be of interest to you. 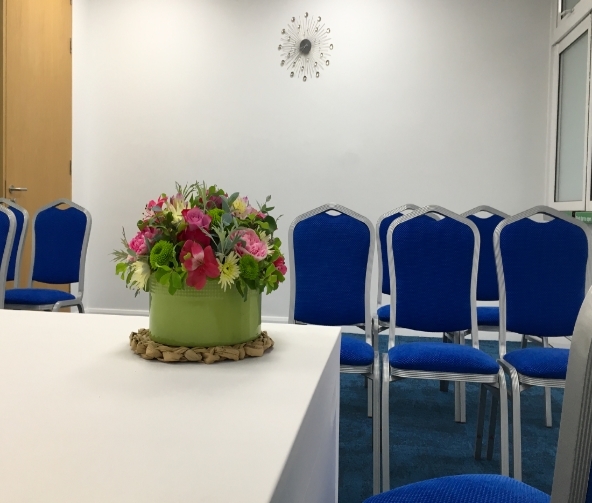 This light and airy modern room seats 10 guests and allows you to have a simple but warm and cherished ceremony. We conduct these weddings on Mondays (afternoons only). Before booking any ceremony you should always ensure you understand the procedure of giving your ‘Notice of Marriage’ and how you should go about booking your wedding. You can find information on this by going to our Documents and Legal Formalities page. In order to book the Register Office you will need to complete the Provisional Civil Wedding Booking Form. On completion of this form it will ask for a deposit amount of £57.00 which is £46.00 for the ceremony plus one certificate of £11.00. You can find more information on fees by going to our Fees and Charges for Registration Services. To provisionally book the Register Office please fill in the Provisional Booking Form. Access to the Register Office is via the car park entrance into the Civic Centre. The Register Office is located on the ground floor of the building. All of the entrances into the building and wedding rooms are suitable for wheelchair users.